The Ride to School days have been going brilliantly for our Class 6 & 8 students. 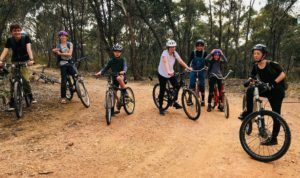 All riders made their way through Lisa’s property to school receiving tips and practice in mountain biking skills and road safety skills. It was impressive to see how each rider looked after themselves and others and rode to the conditions. All students arrived to school on time and thoroughly pumped with excitement! The group also rode home at the end of the day. There is another event planned for Tuesday 31st of October. Please register with Penny Gilbert via text message the night prior. The meeting point will be the Railway Bridge on Langslow St, at 7.50am. Departure is 8am sharp! It is my great pleasure to announce our Class one teacher for 2018. Anne Perry who is our current Class 8 teacher will be taking class 1. Anne is a highly experienced Steiner teacher who has demonstrated her commitment and dedication in our school having taken 3 .5 teaching rounds here! Her beautiful singing voice, which she shares with us each Monday at assembly will not be lost to the school as she shares her gifts with a new class. In a recent chat with Anne about the upcoming task she expressed her excitement at the thought of beginning a new adventure. She has briefly met the Preps on a recent visit and found the group delightful. Camps have commenced already and there are many tales of adventures coming out of the trips the children are making. We are very lucky having Lisa Hall on board, overseeing and participating in so many camps. Her skills and experience bring many qualities to the camp not the least being safety and security. The teachers are continuing to explore the music curriculum through the review process on Tuesday afternoons during the Faculty meetings. The music staff are meeting regularly in preparation for their collaboration with the teachers to plan next year’s program. The College meetings, which will be open to all staff, will be assessment and reporting. Assessment is a key element in the teaching cycle. It is so important that teachers know where their children are at all stages of their journey. It is important, not because we value grading or testing per se, but that we know how to adjust our teaching to meet the needs of the child. It is important so that there are no surprises for parents as the child moves through the grades. Learning and the love of learning is a major goal in the education of your children and the understanding of appropriate assessment is vital in maintaining the confidence of our community in the efficacy of Steiner education. Musical Performance for Monday's Assembly ! Come see Raziel and the Friday String group perform this Monday at the school assembly. All welcome! 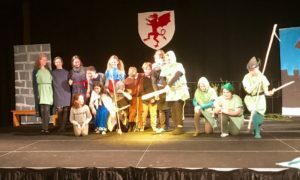 A few pictures from the Class performance of Robin Hood a little while back! Medical & Dietary Information (including Vaccination) Update. In the coming weeks Rachael & Tanya will be contacting families to receive updated information on all students medical and dietary information. As a part of this communication we will be requesting Immunisation Status Certificates for all students where we do not have this on file already. Your cooperation is appreciated with this. This allowance from the Victorian Dept of Education helps pay for travel to/from school by car or bus (car travel must be more than 4.8 kilometers one way). It is not available to Kinder children. If you are new to the school and wish to apply, or currently claim the allowance and have changed address or travel arrangements, please make sure you submit a new claim application form to the office prior to Friday 17th November. You can download a form for either Private bus or Private Car. More information is available at www.education.vic.gov.au/studenttransport. The Office has received several complaints recently about driver behavior in the car park. There has been incident of cars speeding into and around the circuit and also vehicles stopping in the middle of the circuit to chat to pedestrians. Please adhere to the speed limit (5km/h) at all times, drive safely and be vigilant to all people in the area during busy school drop off/pick up times. I am happy to say that all the craft projects are growing as fast as the weeds; this is great news for the children not so for the gardeners. Collectively we are all striving to complete our work as well as we can. This is keeping me very busy, with many children coming into the craft room at lunchtime to continue on with their work. Over the last couple of weeks Huw and JJ, from class 7, have been designing and constructing an external door for the craft room. Thank you to them both for their industry. Spring Fair is fast approaching and I need all the children to bring back to school their completed craft projects. The sooner the better, so could you please remind your child/ren to bring back their work. They can leave it at the office or in the craft room. Welcome back to our final term and the opportunity for students to round out their French studies for the year with some activities that centre around storybook reading and writing. Class Six students have created some lovely posters responding to a range of quotations and illustrations from their class reading of Le Petit Prince. Class Seven students used their time well in the first week back, reviewing a range of French and bilingual childrens’ story books and creating promotional posters for their favourite choices under the banner ‘Decouvrez la joie de lire’ – “Discover the Joy of Reading.” We hope to have these on display very soon. And Class Eight students will now join Class Seven over the next few weeks in designing, writing and illustrating their own storybooks. We hope to read these to our buddies at the end of term. Doug Jones, husband of former Classroom Assistant Helen Jones is fundraising for Muscular Dystrophy. Doug and Helen have a Godson with MD and to help raise funds to combat the condition Doug rode 450km a few weekends back. Muscular Dystrophy is a degenerative muscle-destroying disorder affecting one in every 625 men, women and children in Australia. Leading to the early onset of debilitating heart, breathing and mobility complications, it’s common for those living with the disorder to be fully dependent on a wheelchair by age eight. You can donate via the link below to help Doug reach his target. All late arrivals need to report to the office for a Late slip before going to the classroom. Advice of your child absence can be provided by text at any stage to 0407 124 508. The message will need the child’s FULL name, Class and reason for absence. If your child is marked absent without reason a text message will be sent to parents to advise. 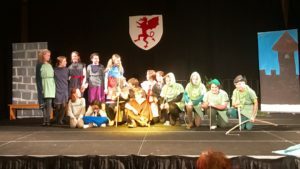 The Office will not perform any further follow up unless contact is made by the parent. Dear Parent community, please follow this link to find beautiful organic wool clothing & nappies for little people! Get into tennis at Castlemaine Lawn Tennis Club!! These 3 beautiful girls are looking for loving homes. They are sweet blue eyed white mini lop rabbits. We also have some gorgeous adult bunnies that are looking for their forever families as well. They are free of charge however will need their calici vaccination before going to their new home. This will cost $20. If you think you would love a bun to join your family, please contact Linda on 0429000420. A warm and fun Nanny is wanted for a small family in Campbell’s Creek. There are some regular weekly hours available and also some casual hours depending on your availability. The person must hold current First Aid, valid Working with Children Check and Police Check. Please call 0430 009 523 for more information.